The University Information Security Office (UISO) has automated processes that identify a significant portion of unauthorized account access without users' involvement. Keeping your passphrase secret and using Two-Step Login (Duo) are the best ways to keep your Indiana University accounts secure. Email notifications: You can set up email notifications to alert you (and, optionally, your department's IT Pro) anytime someone tries to log in using the IU username associated with your personal or group account. 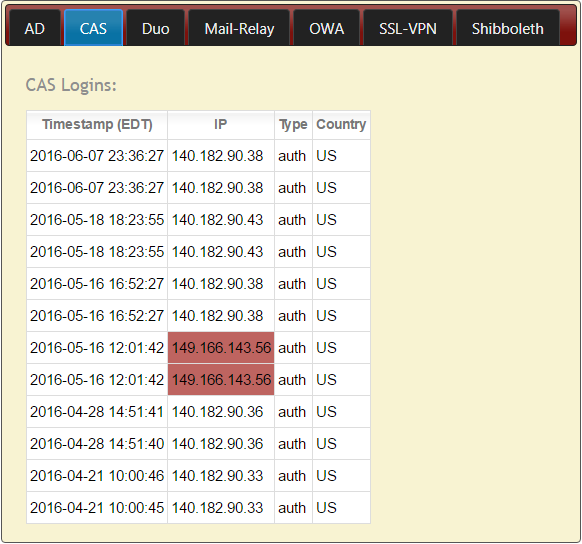 Login history: You can view a 60-day history of login attempts for your account across several UITS services. Log into the Login Activity & Subscription Options page using the personal or group username you want to monitor, and the corresponding passphrase. Send daily emails: Select Yes to receive daily notices about your account's login activity. Send emails for non-US logins: Select Yes to receive email notices whenever your account is logged into from a location outside the US. CC departmental IT staff: Select Yes to send copies of your email notices to your department's IT staff. CC another email address: Select Yes to send copies of your email notices to a specific email address (enter the email address in the provided text field). To save your selections, click Submit. If you are unable to log into the Login Activity & Subscription Options page, email it-incident@iu.edu for help. Each tab in your account login history shows the most recent activity for a particular service, sorted from newest to oldest. Discovering a single failed login attempt on your account is most likely not cause for concern. Individuals frequently make innocent typing mistakes (for example, adding, omitting, or mistyping characters in their usernames) when logging into their accounts. For instance, if user qborgana mistakenly enters borgana while trying to log into One.IU, the error would register in the system as a failed login attempt for borgana and end up listed as such in that user's CAS login history. However, discovering a repeated pattern of failed login attempts may be cause for concern. In such cases, you should examine the timestamps for each attempt. Change the appropriate passphrase: For instructions, see Change your IU passphrase. For guidelines on creating a strong passphrase, see Your IU passphrase. Do not include the names of individuals you suspect of trying to access your account. The UISO will request this information, if necessary. This is document acsj in the Knowledge Base. Last modified on 2018-11-28 12:08:37.